LAS CRUCES, N.M. – A challenging non-conference slate, 17 home games and an appearance on ESPN’s 24-hour College Hoops Tip-Off Marathon highlight the 2014-15 New Mexico State men’s basketball schedule. The Aggies, coming off their third-straight NCAA tournament appearance, open the season Nov. 14 at Wichita State. The Shockers finished the 2013 season unbeaten in the regular season and in the Missouri Valley Conference tournament to earn a No. 1 seed in the NCAA tournament with a 34-0 record. The two squads have faced one another 28 times and the series is tied at 14-14. However, this will be the first match-up since Feb. 21, 1983, which was a 72-70 WSU win. The Aggies last win in the series was a 59-57 triumph on Jan. 23, 1982. NM State then travels to Saint Mary’s Nov. 17 for ESPN’s 24-Hour College Hoops Tip-Off Marathon. Tip is set for 1 a.m. (MST) on ESPN2. This will mark the fourth match-up between the two squads. The teams last played Dec. 23, 2010 at the Pan American Center when the Gaels won a 73-53 decision over the Aggies. NM State’s lone win in the series was Nov. 19, 2000 when the Aggies breezed to an 82-64 win. The Aggies make their highly-anticipated home debut, Wednesday. Nov. 19 against Northern Colorado. The Bears enjoyed postseason success and earned a berth in the 2013 CIT Tournament. The teams have met six times and the series is split at 3-3. This is the second-straight year the teams will meet in the regular season. The Aggies won a 67-63 decision last season. NM State hits the highway Nov. 22 for the Battle of I-10 at UTEP. The two are scheduled for a return trip to Las Cruces, Dec. 6. The Aggies lead the overall series 106-100 and are winners of three-straight. NM State welcomes Stetson (Nov. 24) and Florida A&M (Nov. 26) to the Pan American Center before a tough bout at Wyoming Nov. 29. The Cowboys finished last season on a strong note and earned a berth in the 2013 CBI Tournament. The all-time series is tied at 2-2. The Aggies and Cowboys last played, Dec. 20 1997 – a 60-45 NM State win. The Aggies kickoff the month of December with the annual Rio Grande Rivalry in Albuquerque. The Aggies and Lobos are set for a Dec. 3 match-up at the The Pit. The two teams complete the 2014 version of the Rio Grande Rivalry Dec. 20 at the Pan American Center. The squads split the 2013 series with each team picking up a win on the road. NM State takes its turn in the Sooner State for a Dec. 13 game at Oral Roberts. This marks the first meeting between the programs. The Aggies then face a pivotal road test at Baylor Dec. 17. The Bears finished 2014 off on a high note and reached the Sweet 16, before falling to eventual national runner-up Wisconsin. Baylor leads the all-time series 5-3, but the last meeting in the series was a 61-60 NM State win on Dec. 1, 1980. NM State will stay home for the holidays and close out the month of December and ring in the New Year at the Pan American Center. The Aggies host Northern New Mexico (Dec. 22), Colorado State (Dec. 27), Texas Southern (Dec. 30), UC Irvine (Jan. 3) and New Mexico Highlands (Jan. 6). NM State opens Western Athletic Conference play Jan. 10 at home against Missouri-Kansas City, then a quick turnaround with a pair on the road games at Bakersfield (Jan. 15) and at Seattle (Jan. 17). The Aggies then return to Pan American Center for a three-game home stand welcome Grand Canyon (Jan. 22), Utah Valley (Jan. 24) and UTPA (Jan. 31). The Crimson and White hit the road for a pair at Chicago State (Feb. 5) and UMKC (Feb. 7) and return home for a twosome against Seattle (Feb.12) and Bakersfield (Feb.14). 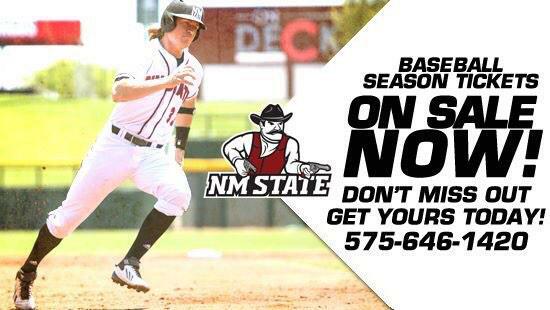 NM State embarks on a three-game road swing at Utah Valley (Feb.19), Grand Canyon (Feb.21) and UTPA (Feb. 28). The Aggies close out the regular season against Chicago State at the Pan American Center March 1. The 2014 WAC tournament begins March 12 at the Orleans Arena in Las Vegas. The Aggies are the defending tournament champions and won the league crown three years in a row. For complete ticket information contact the Pan American Center ticket office at 575-646-1420.